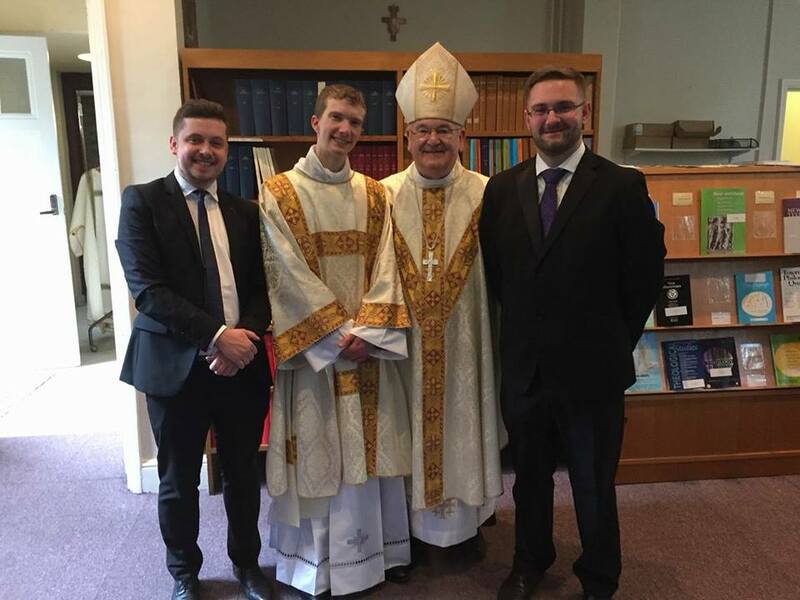 There was an air of celebration at Allen Hall Seminary in London on Saturday when three of the seminarians were ordained to the Diaconate – and one was for our own diocese. Laurence Bryce, who is originally from Portsmouth and studied at Cardiff University, has been in formation for the Archdiocese of Cardiff since 2013. Deacon Laurence spent a successful year long pastoral placement at St. Philip Evans, Llanederyn and for the past year has worked part time at Newman House, the Catholic Chaplaincy to the University of London. “The bishop and the priest retain the diaconal office whilst they minister to God’s people, empowering them to fulfil their baptismal role as a priestly people. A telling reminder of that truth is given by Pope Francis when he washes feet at the Mass of Chrism and takes off his vestments to reveal the deacon’s stole. In sharing in the Sacrament of Orders, the deacon is authorised and empowered to order, direct, focus the attention of the people on their dignity as baptised members of the Body of Christ”. The office of deacon is multi-faceted with focus being centred on breaking open the Word through preaching and teaching, with an open ear listening to the call of the Lord in their life at every given moment and through the voice of the bishop. And in breaking open the Word the deacon is encouraged to practice what they teach, setting the example, no matter how difficult it may seem, striving in fidelity to Almighty God and His Commandments, the greatest of which is the call to love … to self-give … to charity. The deacon ‘seeks out’ those in need and works with the pastor, the priest, to reach out and draw in. Deacon Laurence will be completing a summer placement at St. Philip Evans, Llanederyn and will return to Allen Hall to complete his formation in September. Deacon Laurence is pictured with Archbishop George after the ordination, along with Elliot Hanson (R) who will move to Rome and complete his studies there, and Dale Cutlan (L) who having completed the propedeutic year in Spain will begin formal studies at Allen Hall in September. For further information on Vocations within the Archdiocese please contact Fr. Paul Millar, the Vocations Director or visit our Vocations pages.